I've always been a big fan of apples in salads. Add a couple cubes of Gruyere, a few nuts and some good greens and you've got yourself a wonderful filling dish. For this salad, I used this new nut mix from Back to Nature. If you're a regular visitor to this blog, you'll know that I'm a firm believer in making sure your food is as natural as can be (read chemical-free, and where you can pronounce every word on a product's ingredient list). These nut mixes fit the bill for me: they're 100% natural and made this salad easy to make and ready to eat in minutes. I used a mix of almonds, raisins, pumpkin seeds, pecans and dried apricots. I still have about 15 apples to use up... any ideas on other dishes to make? I still have a few surprises to post for the start of my 2nd apple week, so stay tuned! Add the olive oil to a small bowl. Whisk in the lemon juice and apple cider vinegar. Add a good pinch of salt and pepper. Pour the vinaigrette over the salad just before serving so the lettuce doesn't wilt. Enjoy! Tip: Don't cut the apples too long before you're ready to serve the salad or they will start to change color. You can toss all the other ingredients for the salad in your serving bowl and make the vinaigrette in a separate bowl. Just before serving, cut the apples and add them to the salad, then add the dressing. Lovely blog with nicely composed pictures. Keep posting. Great salad combo! How about apple chutney or slicing them with a mandolin and oven drying to eat as a snack or in muesli? I love the fruit-nut-cheese combo in salads! It's my go-to fall quick dinner, especially now that apples and pears are EVERYWHERE! I love it! A few great ingredients and you have a fabulous salad! Also, I loved the look of those fritters on your other post--delicious! this looks refreshing, healthy and DELISH! Great combo, this is almost the same combo that I put on pizza (apples, gruyere and candied walnuts). Yum! Great salad and it makes such a change from the regular lettuce and tomato that normally gets served up in our house. I love apples is salads too. I'm more into the blue cheese combo than gruyere but I wouldn't say no to that lovely of yours. Jessica Lee Binder: Blue cheese would work wonderfully too. Gruyere has a nice sharpness that complements the sweetness of the apple - which is why I love pairing it with apple. But who could say no to blue cheese? 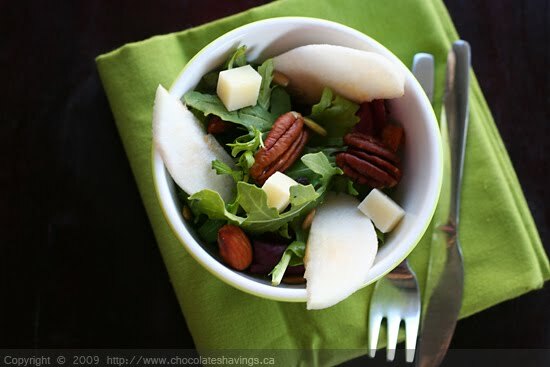 I love to use fruit on salads and often make this nutty, apple and green leaves salad! Sometimes I grate or shave parmesan cheese on top of it! Great blog and wonderful recipes! Fabulous flavor pairings...Gruyere is my favoire. Looks amazing! Verena: Parmesan would be a wonderful addition to this salad! since i've found your blog (on the To Dine For blog)- i'm addicted!